We have been working in our willow beds all weekend, coppicing and planting. Felled some of the roadside trees that were threatening to shade out some of the willows. So now we have some good ash logs for thr woodburner. 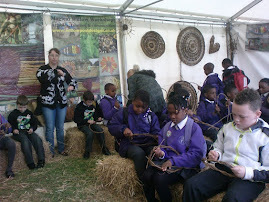 We are building a willow dome with a primary school at Lytham St Annes on Tuesday. Still have some dates available for spring projects! have finally got the Maintenance guide scanned in and uploaded to its own website. I had to do this because Sefton Council have taken down their willow website. we expected it to happen some time as the Sefton Living Shade Project actually finished years ago! As i wrote the text for the website i have no concerns about reposting it on my own site. its a good idea for schools to print out each page, laminate it and keep it handy in the staffroom. then there are no excuses for not maintaining the willow structures. we have been working in Peter Rabbits garden today. its been cold and very wet all day and we have been renewing the willow fencing in readiness for the re-opening of the place and 5th February. apparently the Chinese and Japanese go wild for Beatrix Potter and flock here! all of the signs are in English and Japanese! we have spent an uncomfortable day on our bums crawling around the garden weaving willow hurdles. the finished result looks pretty good. worth a visit if you have small children.